The juniper is an evergreen tree native to Europe, Asia, and the northern parts of North America and it is especially abundant in central Texas and Eastern Oregon. Not all juniper berries are edible, in fact, some are poisonous. These are the only juniper berries edible as a fruit. Juniper berries aren’t actually real berries at all, they are female seed cones that come from the juniper plants. 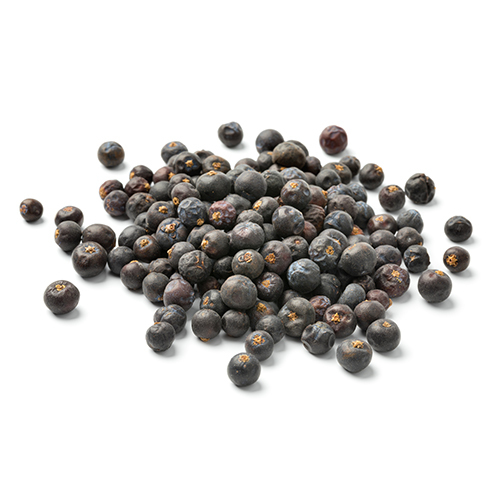 Juniper berries are tart and sharp, with a resinous, piney flavor and hints of citrus. Just a little of the spice can add quite the bitter-citrus kick you’re looking to add to any dish. They can also be found in some beauty products like lipstick, foundation, eyeshadow, hair conditioner, bubble bath, and bath oils. The citrusy, piney berry that’s used to flavor gin is the real key to feeling warmed from the inside out. If you want a strong juniper aroma and flavor to your dish, crushing fresh berries before adding them to a sauce or marinade is the way to go. To bring out juniper berries’ slight citrus flavor, most recipes call for another fruit such as apples or prunes to be added. Add a little ginger or garlic to your spice rub for a savory flavor, or you can stew the berries before marinating or basting the meat with them. Juniper is commonly used with lamb, roast duck and you can even add them to a pot of chili, to give a rustic flavor that compliments ground smoked chile peppers. As long as the juniper tree is not in standing water or dark shade, these trees can grow in almost any conditions. The berries take more than one year to ripen, so try to get the second year ones. In general, the best time to harvest is in the fall, but often they can be found all year long.